The population grows until a peak in year 2023 and then falls rapidly. In 2035, the population is between 487,000 and 465,000 - in line with the Conference Board estimate. In scenario 2, I assume that our fertility rate increases to the Canadian average and remains constant, and that net immigration is zero. There is very little change from scenario 1: the population peaks in 2023 and then starts to fall rapidly. The population in 2035 is between 495,000 and 475,000 - in line with the Conference Board estimate. 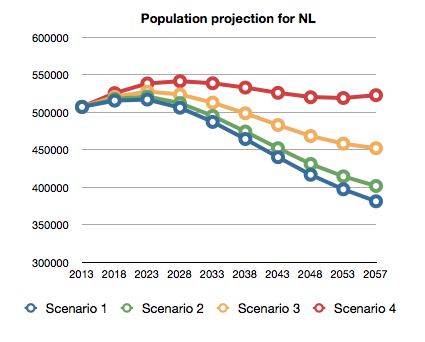 In scenario 3, I use current NL fertility rates, but assume immigration of 1000 twenty year olds per year (actually 5,000 every five years in lump sums). Again, the population peaks in 2023, but it doesn't fall as rapidly afterwards. In 2035, our population is between 512,979 and 498,728 which is above the Conference Board estimate. In scenario 4, I use current fertility rates but assume immigration of 2000 twenty year olds per year (actually 10,000 every five years in lump sums). In this scenario, population is basically flat.